Piano teacher Derek Moule (AMusA, BSc, MClinAud) has over 10 years of teaching experience and a deep love of music which he is enthusiastic about passing on to students. Derek gives regular performances and enjoys writing music. His compositions include music for piano and brass instruments and a book of piano lesson sheets for beginning piano students. These lessons sheets are provided free of charge to all beginner piano students. Classically trained, Derek also regularly performs and teaches all styles including jazz, blues, rock and pop as well as classical repertoire. 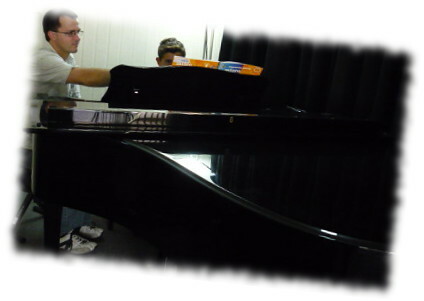 Derek feels it is important for students to feel comfortable with their teacher and enjoy lessons and is therefore happy to give a free introductory lesson so that you can meet him and get a feel for what piano lessons will be like. Piano lessons should be fun! Derek believes enjoyment is critical for learning and continuously explores new ways to make learning fun. To help younger students learn and gain maximum enjoyment from lessons, lessons are broken up into smaller chunks with time at the piano mixed with musical games designed to consolidate the skills they are learning, and fun duets with the teacher. Derek likes to utilise technology during lessons and has written music computer games that students can play at home online to reinforce skills learnt during lessons. For older students, Derek feels it is important to understand why the student wishes to learn piano. Some students are ambitious, wanting to concentrate on their technique and work towards exams and competitions. Other students prefer a more relaxed approach and would like to gain pleasure from learning some of their favourite pieces for their own enjoyment. In both cases the student is developing skills towards an interest that has the potential to give them a lifetime of enjoyment. Longer lessons, one-off lessons etc by negotiation. Available by negotiation when appropriate. 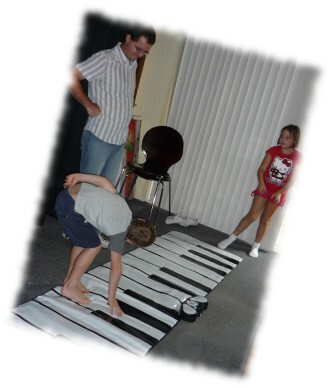 If you are interested in piano tuition, please phone Derek Moule on 0404 431 022 or contact Derek. This video gives some ideas for parents of children learning the piano to help encourage them to practise. I believe that enjoyment is the key to success, and this is stressed throughout the video. It is important to be positive and encourage your children rather than trying to force them. Using musical games, playing with your children, using backing tracks and giving them the opportunity to perform can all help.